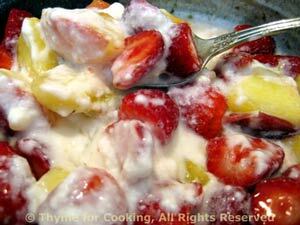 Peaches and Berries in Yogurt Cream, Thyme for Cooking summer fruit salad. Stem and cut berries if needed. Cut peaches in half around pit and twist, gently. If the peaches are 'freestone' the halves will come apart easily. Slice. If they are 'clingstone' the halves will not budge and you'll have to cut the peach off the stone in chunks. Put fruit into a medium bowl and sprinkle with sugar. Stir gently. Add to fruit and stir gently. Serve.